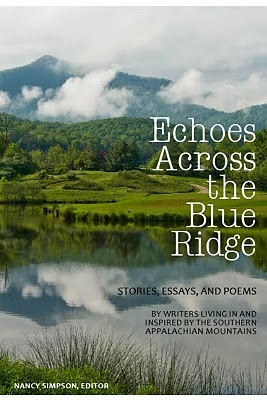 Echoes Across the Blue Ridge consists of the work of 62 authors: members of North Carolina Writers’ Network West. The volume includes stories and poems reflecting the everyday lives of mountain people, their experiences, their outlook on life, and their overall philosophies. The subjects range from the mundane to hilarious comic sketches. The reader will laugh, cry, and feel the heart and soul of these writers. Contributors include former North Carolina Poet Laureate Kathryn Stripling Byer of Cullowhee; Gary Carden of Sylva; and an introduction by Robert Morgan, among many more. This collection was edited by Nancy Simpson and received blurbs from acclaimed NC authors Ron Rash and Lee Smith. It would make the perfect holiday gift for anyone who loves great writing or who is interested in North Carolina’s culture and history. Echoes Across the Blue Ridge is available anywhere books are sold, through the NetWest website, and through www.ncwriters.org. Congratulations to NetWest and all who contributed to this important piece of North Carolina heritage. This was written by charles. Posted on Friday, December 2, 2011, at 8:42 am. Filed under Uncategorized. Tagged Echoes Across the Blue Ridge, NCWN, NetWest, WNC Women. Bookmark the permalink. Follow comments here with the RSS feed. Both comments and trackbacks are currently closed.